← Are White women high school dropouts getting sicker? Everyone wants a number. You want to know if the number is different from last year, or 100 years ago. Numbers are great. But the number you’re using is usually a statistic, a number calculated from a sample drawn from a population. You want a good number, you need a good sample. And a big one. And that’s going to cost you. Who didn’t love the news recently that single British men ages 18-25 change their bedsheets only four times a year? Really? Really. How does anyone know this? Ergoflex, a memory-foam mattress distributor. At least UPI had the decency to report, “No survey details were provided,” although somehow Time found out the sample size was 2,004 (men and women, all ages). Rubbish, I reckon, or bonkers, or whatever. No one can resist a number; methods details don’t make it into the tweet version of the press release. 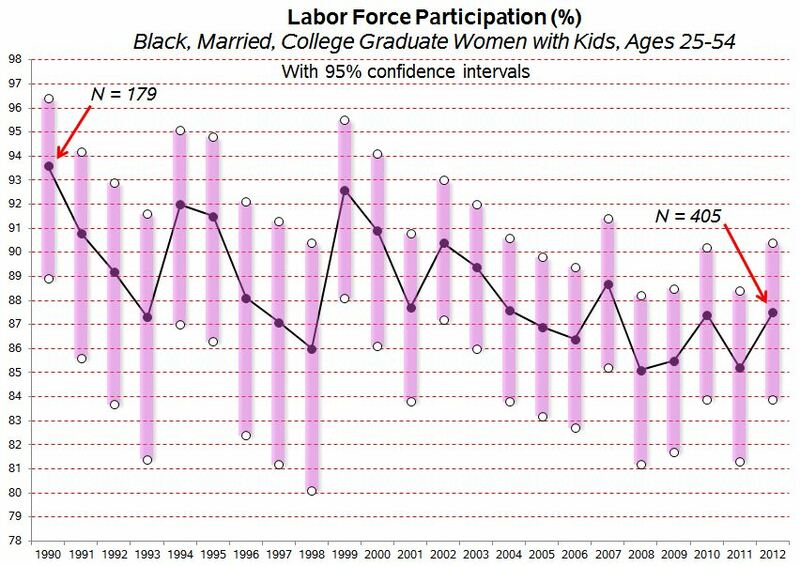 Here’s a more answerable question: What is the labor force participation rate for married, college graduate women with children, ages 25-54 in the United States? I’d say 76.1% — plus or minus a percentage point — based on the gold standard for labor force data collection, the Current Population Survey, easily analyzable these days for free with the IPUMS online tool.That’s from a sample of 60,000 households with a 90+% response rate, at a cost of umpteen million taxpayer dollars (well spent). As more women have gotten college degrees, and the CPS sample has been enlarged, the sample size for this trend has grown and the error bars have shrunk, from a spread of almost 3 points to just less than 2. Still, there are only 8,265 of these women in the sample. There aren’t many one-year changes in this trend that are statistically significant at conventional levels. Of course, with this sample size you could say with confidence the labor force participation rate was higher in the late 1990s than the early 1990s (but check the survey redesign in 1994…), and higher again in the late 2000s than in the early 2000s. But were 2007 and 2002 sample flukes? And if so, what about 2012? Now the sample size is a couple hundred and the confidence intervals are more than 6 points wide; there isn’t a pair of years in the trend that doesn’t have overlapping confidence intervals. And look at 2007 and 2012 — Black women are blipping in the opposite direction from the larger group in each of those years. Yes, if you put the whole Black trend in the blender with a time trend you have a significant decline of about a fifth of a point per year on average (and a sliver of this change is because of the increasing tendency of college graduates to be in grad school and not working — there are 13 of them in 2012, dragging down the participation rate by 0.6%). But don’t hang a lot on one year. Eyes on the prize: who cares what the exact number is? Is it a lot or little, going up or going down, higher or lower than some other group? That’s usually what matters. You should send this to WaPo, the AP, NY Times, LA Times, CNN, FNC, etc. I love your final conclusion!